Beautiful engraved Certificate from The Empire of Japan issued during WWII. 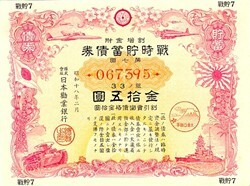 This historic certificate has an ornate engraving of Japanese Military Machines ( planes, warship and tank ) and other propaganda. The red colored certificates have been particulary hard to find. This historic document is over 60 years old and will be a great addition to any collection.